Click on the thumbnail to view the larger image. All images copyright AF Train Masters. You may link to these images, but you may not copy them without permission. Thank you! An explanatory note for collectors: Under the K-Line brand, boxcars were manufactured in three "gauges" -- full sized O-Gauge (just over 9 inches in shell length), O27-Gauge (just over eight inches in shell length) and S-Gauge (O27-Gauge shells mounted on S-Gauge trucks). 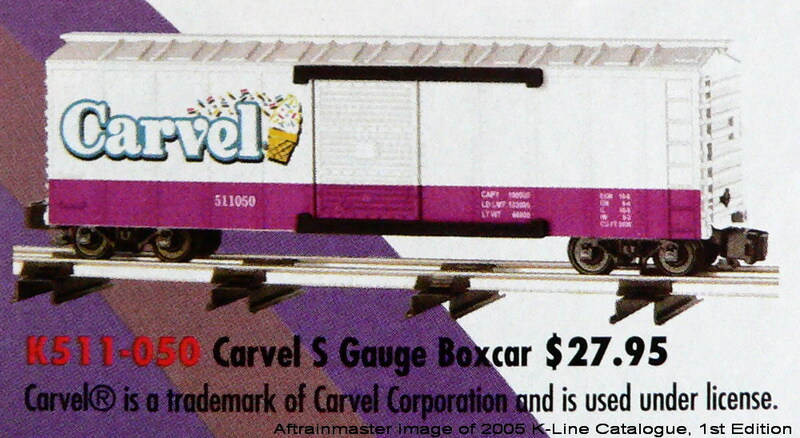 Based upon our research to date, with one exception (a custom car for a hobby shop), K-Line did not replicate the S-Gauge designs in either their O-27 or O-Gauge offerings, nor were the O-27 or O-Gauge designs replicated to S-Gauge. While the "full-sized" O-Gauge K-Line offerings do not translate well to S-Gauge, their O-27 offerings are exact matches to the S-Gauge K-Line shells. The S-Gauge conversions shown on this page are 100% K-Line cars originally offered as O-27 gauge to O-Gauge (three rail) collectors. They have been equipped with S-Gauge wheelsets, using all original K-Line equipment. They are in that sense unique. Since the S-Gauge products utilize O27 shells, it is possible to reverse the process noted above and craft O27-Gauge cars from S-Gauge originals. These processes enable a much broader selection of both S-Gauge and O27-Gauge boxcars for collectors, both two rail and three rail. Our research into K-Line is ongoing and we ernestly invite comments from K-Line collectors who may be able to shed additional light on the compatibility of O-27 and S-Gauge K-Line offerings, with an eye bent especially toward discovering if there were any designs which were replicated exactly as original offerings by K-Line in both gauges. If you are a K-Line collector, either two rail or three rail, AF Train Master stands ready to craft cars for you upon request to match designs not formerly available to you. These cars utilize all original K-Line materials and are "custom" only to the extent that the wheel sets are adapted to meet your configuration. If you see a car on this page, it can be made available to you in either O27 or S gauge. Thank you for visiting AF Train Masters!